Prior to the invasion of Russia, the Luftwaffe had determined that dive-bombing was the proper way to attack armored vehicles. However, four days after the beginning of Operation Barbarossa, on June 26, 1941, Stuka Geschwader 2 attacked 60 Soviet tanks south of Grodno, later discovering that only one had been knocked out. During the rest of 1941 and 1942, the inadequacy of dive-bombing tanks became more and more evident. 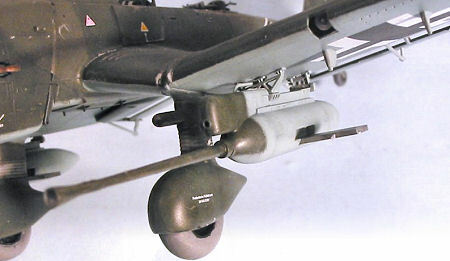 The Ju 87G was the final version of the Stuka, armed with two 37mm Rheinmetall-Borsig BK3,7 anti-tank cannon, which fired fired special armor-piercing ammunition with tungsten cores, at a muzzle velocity of 850m/sec. They carried pods fitted outboard of the landing gear, with the ammunition in six-round clips. The 7.9mm or 20mm wing guns were deleted and - since dive-bombing was not possible with the additional weight of the guns - the dive brakes were also deleted. In February 1943, "Panzerjagdkommando Weiss" was formed at Briansk to test the tank-busting version of the Ju-87 D-3, which had been developed at the Luftwaffe's experimental station at Rechlin. While the Flak 18 was no longer useful as an anti-tank weapon in ground battles, initial tests of the prototypes - which included attacks against Soviet landing craft in the Black Sea - demonstrated that the gun was still useful when fired from the air. In three weeks, Hans Ulrich Rudel - who had been assigned to the unit to lead the development of tactics - destroyed 70 of these boats. In March 1943, the unit took part in a tank battle around Belgorod, in which Rudel knocked out his first tank with the new tank-busting Stuka. The unit also operated during Operation Citadel - known to history as the Battle of Kursk, the largest tank battle in history - where Rudel knocked out 12 T-34s in six missions on the first day, using his newly-developed tactic of hitting the Soviet tanks from the rear, where they were more lightly-armored and the engine was vulnerable to cannon fire. Following this success, more Ju-87 D-3s were converted and designated the Ju-87G-1. The aircraft, which arrived on the Eastern Front in October 1943, and were known as Panzerknacker (Tank Buster) or Kanonenvogel (Cannon Bird). The Ju-87G-2, which was based on the Ju-87D-5 with longer-span wings, appeared in early 1944. 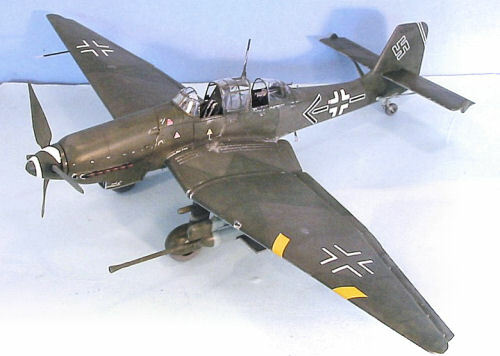 Production of the Ju-87 Stuka was finally halted in October, 1944, when the only unit still operating it on daylight missions was Rudel’s SG 2. Hans Ulrich Rudel, the most-decorated German combat pilot of the Second World War, was the outstanding proponent of the Stuka. Bor-n in Silesia in 1916, Rudel was the son of a Protestant minister. Never a good student, he received a limited education, joining the Hitler Jugend in 1933 and becoming a dedicated Nazi, a belief he never gave up. In 1936, he became a flying cadet in the Luftwaffe as a way to continue his sporting activities. Rudel was not considered a good pilot during training, and was not chosen for fighter pilot training. After passing his flying training course, Rudel applied for further training as a dive-bomber pilot but was turned down. Instead, he flew long range reconnaissance missions during Polish Campaign as a Leutnant. On October 11, 1939, he was awarded the Iron Cross 2nd Class for this work. He continued applying for Sturzkampfflugzeug Schule and was finally admitted in May, 1940. After completing the course, Oberleutnant Rudel was posted to LG (St.) 2 where he spent the period of the Battle of Britain. He was transferred to 1.I/St.G. 2 “Immelmann” and took part in the airborne invasion of Crete in May, 1941, following which the group was transferred to the Eastern Front. At 0300 on June 23, 1941, Rudel flew his first combat dive-bombing mission. During the next 18 hours, he flew four more combat missions. On July 18, 1941, he was awarded the Iron Cross 1st Class. On September 23,1941, I and II/St.G. 2 attacked the Soviet Baltic Fleet in Kronstadt harbor, during which Rudel sank the pre-dreadnought battleship "Marat," hitting the ammunition store and breaking the ship in half. On December 24, 1941, Rudel flew his 500th mission and on December 30th he was awarded the Deutsche Kreuz im Geld (German Cross in Gold) by General Freiherr Wolfram von Richthofen. On January 15, 1942, he was awarded the Ritterkreuz (Knights Cross) before being sent back to Germany to train new Stuka crews. He voluntarily returned to the Eastern Front in June, 1942 and became Staffelkapitän of 1.I/St.G. 2 that September. Having flown his 1,000th mission in February 1943, Rudel was assigned to "Panzerjagdkommando Weiss" as previously related, to develop tactics for the anti-tank Stukas. He was awarded the Eichenlaub (Oak Leaves) to the Knight’s Cross for his actions in the tank battle at Belgorod, and the Swords to the Knights Cross on October 25, 1943, for his performance during the Battle of Kursk. In early March, 1944, having flown 1,500 missions, he was promoted to Major and became Gruppenkommandeur of II Gruppe of what was now Schlachtgeschwader 2. During a mission in late March, Rudel's formation was attacked by a squadron of La-5s. One Stuka was shot down and crash landed with the crew unharmed. Rudel landed and to rescue his friends but snow and mud bogged down his airplane, making it impossible to take off. The approach of Soviet troops forced all to flee on foot, which meant they would have to cross the Dniester River to reach the German lines. The four Germans stripped to their long johns, and swam across the ice-clogged 900-foot expanse of freezing water. A few yards from the far shore, Erwin Henstchel - Rudel's close friend and gunner, with whom he had flown 1,490 missions - drowned. The other two German fliers died of exposure soon after making it across the river. Pursued by hundreds of Soviet troops intent on collecting the 100,000-ruble bounty Stalin had placed on his head, Rudel was shot in the shoulder while being chased by troops on horseback with dogs. Over the next 24 hours, Rudel - alone and unarmed, barefoot and nearly naked in sub-freezing winter weather, without food, compass, or medical attention - crossed 30 miles of enemy territory to make it back to the German lines. On March 29, 1944, he was awarded Diamonds to his Knights Cross with Oak leaves and Swords, the highest German military award, for this feat. Promoted to Colonel and made Geschwader Kommodore, Rudel was shot in the thigh in November, 1944, while flying against tanks near Budapest, but returned to service within a few days with his leg in a plaster cast. On January 1,1945, he became the only German soldier awarded the Knights Cross with Golden Oak leaves, Swords and Diamonds, which had been specially created for him. In February, 1945, Rudel’s right thigh was shattered by anti-aircraft fire near Frankfurt am der Oder. He managed to crash land in German held territory and was taken to a field hospital where the leg was amputated. An artificial limb was fitted at a hospital in Berlin, and against medical advice he returned to his unit, where he flew operations to the last day of the war, being carried to the planes and placed in the cockpit by his men. At the end of April, he volunteered to fly a Stuka into Berlin to rescue Hitler from the Red Army, but the request was turned down. When the surrender was announced, he planned to fly a suicide mission and was only talked out of it by Wolfram von Richtofen. With hostilities to cease on May 8, 1945, and facing capture by the Russians, Rudel and his men decided to try to reach the West. Stab and II/SG 2 were based at Kummer, in northern Bohemia, I/SG 2 was in Austria, with III/SG 2 near Prague. I and III Gruppen both escaped to the west in the days before the surrender. The Stab and II/SG 2 had only a few serviceable aircraft; Rudel decided to fly as many men out as possible, while a vehicle convoy would try to reach the west with the rest of the unit personnel. On the afternoon of May 8, Rudel led three Ju-87s and four Fw-190s flown by Knight’s Cross winners Oberleutnant. Hans Schwirblat, Staffelkapitän of 10.(Pz. )/SG 2, Major Kurt La u, Kommandeur of II/SG 103, and Major Karl Kennel, Kommandeur of II/SG 2, westwards in the afternoon of 8 May. They made radio contact with the US XIX Tactical Air Command, and were directed to fly to the airfield at Kitzingen, then home of the 405th Fighter Group. During the two-hour flight, the formation encountered Soviet aircraft, but escaped unharmed, and arrived at Kitzingen late in the afternoon. After circling the airfield, the seven German aircraft landed to surrender, with Rudel - the first to land - smashing the undercarriage and the propeller blades of his Ju-87G-2, while Schwirblat crashed his Ju-87D-5, and Kennel wrecked the right wing and sheared off the undercarriage of his Fw-190A-8. The other aircraft, carrying passengers, made normal landings. The third Ju-87 stopped in front of the control tower and the Feldwebel piloting it helped his girlfriend out of the rear seat. One of the Fw-190s carried a passenger stuffed in the radio compartment. After the war, Rudel moved to Argentina, where he became a close friend of the pro-Nazi fascist dictator Juan Peron, and also worked to reorganize the Nazi Party in Argentina with other unreconstructed Nazis while writing two books, one condemning the German soldiers who attempted to assassinate Hitler and the other blaming the senior staff officers of the Wehrmacht who failed to understand Hitler’s military genius for losing the war. He returned to Germany in the mid-50s after making a name for himself in the world of mountain climbing by becoming the first amputee climber to climb Aconcagua, the highest mountain in the Americas, as well as climbing the highest volcano on Earth, Llullay-Yacu in the Andes three times, the final time to bury a climbing companion who died on the second climb. During the 30 years after he returned to Germany, he dedicated himself to trying to rebuild the neo-Nazi movement as a leader of far-right political groups, depending on his status as Germany’s most decorated war hero to avoid imprisonment for these criminal activities. During the Second World War, Rudel logged 2,530 combat missions, including 400 in Fw-190s during which he shot down 11 enemy aircraft. Flying the Ju-87, his confirmed victories - those witnessed by two or more pilots - include 518 tanks, 700 trucks and other vehicles, 150 flak and artillery positions, and the battleships October Revolution and Marat. During these operations he was shot down 32 times. He died in 1982 at age 66, a true believer in Adolf Hitler to the last. 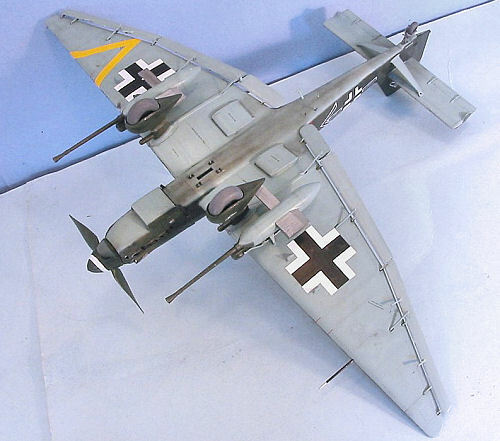 Prior to this release, the only 1/32 G model ApStuka available was an excellent all-resin kit by Jerry Rutman. This kit by Hasegawa follows their policy of releasing a solid basic kit, that can be built out-of-the box by the average modeler to result in a good-looking modeler, without lots of “bells and whistles” in terms of kit-provided super-detail. The molding of the 208 kit parts is crisp, with engraved panel and rivet detail. In reality, the Stuka did not have a flush-riveted airframe, but this is a small point and the completed model will look very good under a coat of paint with this level of surface detail. The cockpit is not as detailed as a resin cockpit would be, but there is enough there to have a good-looking result with an out-of-the-box build. The clear canopies are very thin and very clear. The only thing the cockpit lacks are seatbelts, which are easily-obtainable from aftermarket companies. 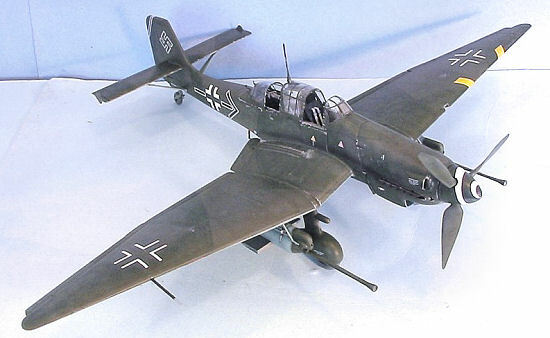 With a separate engine cowling, as well as separate extended wingtips, it is obvious that other versions of the Stuka will show up down the line, and the kit can be built as either a Ju-87G-1 or Ju-87G-2. The kit decals are good and provide markings for a Ju-87G-2 flown by Rudel in September 1944, and for an SG 2 Ju-87G-1 Stuka. Commendably, they are thinner than previous Hasegawa decals, and the white areas really are white. The first run of this kit, which can be obtained from HobbyLink Japan, includes white metal figures of Rudel and his Alsatian dog. I began construction of the model by painting all the cockpit parts with Xtracrylix RLM66 Schwartzgrau. I then drybrushed the parts with Metalizer Aluminum to “pop out” detail, then painted the instrument panel. The cockpit went together easily, and I used the extra photoetch seatbelts from the two Trumpeter Me-262s I did in November, to finish the detail. While I was doing this, Jerry Crandall published his build of the kit and reported some difficulty in fitting the cockpit inside the fuselage. I made sure to do a lot of test-fitting, and got the parts in position nice and tight after sanding the edges to insure good fit. I made sure the side walls fully attached to the fuselage halves by clipping them in place after applying glue. Having done this, the fuselage we nt together without difficulty. I made certain to attach the outer wingtips before further wing assembly, to be sure I got the outer surfaces mated up right. I then sanded the interior of the wing tips to insure proper fit. Doing this, I didn’t have to sand things down after assembly and lose surface detail. I glued the wing subassembly together without attaching either the landing gear or separate control surfaces, having learned my lesson about knocking those surfaces off during handling while constructing the model with the problems I created for myself with a Ju-52 kit. After attaching the wings, horizontal tail surfaces and engine cowling, I found I needed Mr. Surfacer 500 for the seams on the fuselage and cowling centerline, and on the wheel spats. I rescribed the panel lines and recreated the rivet detail with my pounce wheel where necessary. The canopies have a lot of bracing on the inside, for which Hasegawa provides decals. Unfortunately those decals have sufficient carrier film that they will ruin the look of the canopies if applied uncut, and cutting the decals would make them too thin to use easily. It turned out to be much less difficult to break out a 0000 paintbrush and paint the RLM70 Schwartzgrun and RLM66 Schwartzgrau by hand - fortunately, I have had a lot of experience painting the interior of cockpit canopies to get them right on other projects. I also discovered I needed to cut out the “notch” in the rear of the forward canopy so that it could slide back all the way around the radio mast in the open position. I took my time doing that, since I didn’t want to break the very thin canopy. I then attached the windscreen and the central canopy in position and tacked the pilot and gunner canopies in the closed position after masking them, in preparation for painting. The airplane Rudel surrendered at Kitzingen on May 8, 1945, was described by observers as having a "patched and well-worn" RLM70 Schwartzgrun/RLM71 Dunkelgrun splinter scheme. After painting the lower surfaces with Xtracrylix RLM65 Blau, I freehanded the 70/71 upper scheme with Xtracrylix, then went over each with Gunze-Sangyo’s slightly-different version of those colors, finishing off with the Xtracrylix color thinned with 70% thinner, to get a weathered, “well-worn” look to the paint. When this was dry, I gave the model a coat of Future. I used the new EagleCals sheet EC 97, which has the markings for Rudel’s last Ju-87G-2, s/n 494 110. (The kit decals are for a different Ju-87 Rudel flew in the fall of 1944) The EagleCals are printed by MicroScale and went on with no problem with the use of Micro-Sol. I applied exhaust stains and oil smears with Tamiya “Smoke,” then gave the model a coat of Xtracrylix Satin varnish, which was followed by two coats of Xtracrylix Flat varnish. I then attached the landing gear, cannons, ailerons and flaps, and the braces for the horizontal stabilizer. I unmasked the canopies and decided to pose the pilot’s canopy fully open, with the gunner’s canopy as open as I could with the MG82 rear guns mounted. This was actually more difficult than expected, due to the fact that Hasegawa appears to expect the modeler to close the canopies. The pilot’s canopy is just small enough to make fitting it over the center canopy in the closed position quite difficult. In the end, I had to cut the center canopy loose, then attach the pilot’s canopy over it, then attach the entire assembly, first attaching one side using cyanoacrylate glue and accelerator, then the other, holding it in position and applying accelerator while squeezing everything into position. Had I realized this was going to happen, I would have vacuformed a canopy. With any luck, Falcon will make a canopy for this kit, which will solve all of this problem. In the meantime, if you are afraid this sort of “industrial strength modeling” may harm your canopy, I suggest you pose it closed. As to weathering, the few photographs of the airplane don’t show it with a lot of “dings” other than those around cowling fasteners, fuel tank filler points, etc., which I did with drybrushed Metalizer Aluminum. The kit was not as easy to build as I had expected, but it was not that difficult, other than posing the canopies open. If you take your time, this kit will not give you any problems, and the result is a really nice-looking model. I’m sure the aftermarket will come up with resin cockpits and such - and hopefully a vac canopy. Eagle Editions has already announced ”correct-shape” propeller blades, but I am satisfied with my out-of-the-box build that the only thing really needed is seat belts and a vac canopy for ease in posing open - anything else is just extra stuff that will be “nice to have” if you really want it. Overall, I thought the kit was easier than the 1/48 Hasegawa Stukas, with superior surface detail. Highly recommended, and EagleCals makes alternative markings for those who don’t want to do one of Herr Goose-stepper’s Stukas.